Doctor doctor, I'm feeling lightheaded. Not content with explaining how you'll build your own vibrant medical centres in promising hospital sim Two Point Hospital, developer Two Point Studios took to the stage at last weekend's PC Gamer Weekender to show off some of the bizarre new illnesses we can expect to deal with. In the following snippet from the talk, Lauran Carter from Two Point grills colleagues and studio co-founders Ben Hymers, Gary Carr and Mark Webley about the process of coming up with the enjoyably silly ailments, which this time around include mummification. That illness doesn't have a name yet, but the cure appears to involve sticking the subject into a sarcophagus, a treatment that I believe is actually offered on the NHS. You may also spot someone suffering from lightheadedness, a syndrome that manifests in quite a literal way. As you might expect, any illness idea that makes the team laugh has a good chance of making it in—the key is coming up with a funny name and corresponding animation, which will necessitate an equally funny cure. The full panel is worth a watch, which you'll find below. 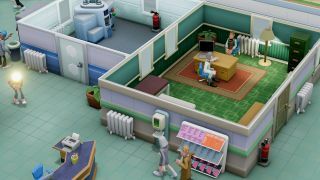 Two Point Hospital will release some time this year.